Hey, 'Fetti Fans, welcome to Day 3 of the March Release for Reverse Confetti! This is such a fabulous release, with five new stamp sets and seven new Confetti Cuts! 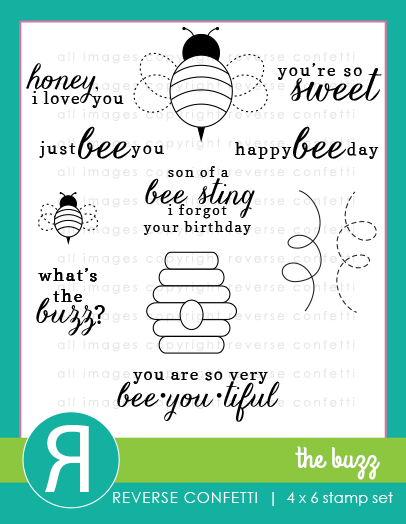 a fabulous sentiment set called Shine Bright and a sweet "bee-themed" set called The Buzz. 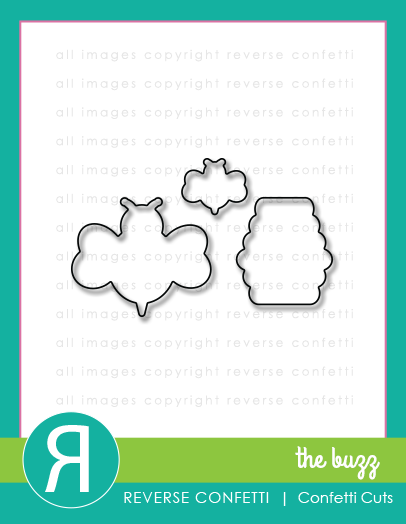 First up, I'm sharing the cards that I made using The Buzz. I diecut the white panel using the largest scalloped circle from Circles 'n Scallops Confetti Cuts. 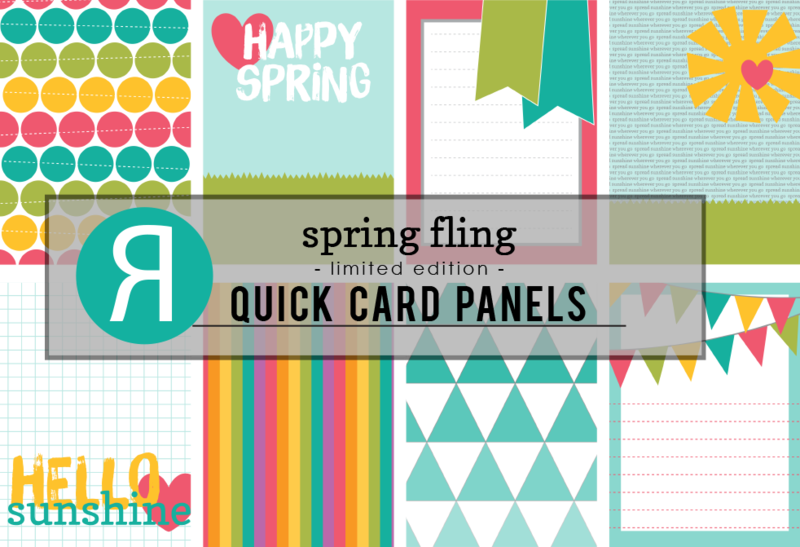 On the aqua mist panel, I adhered a Spring Fling Quick Card Panel that I trimmed down. I stamped my sentiment from The Buzz. I stamped the bee from The Buzz on some vellum (which I diecut using the coordinating Confetti Cuts) and heat embossed it in black. Then, I used a marker and coloured in the back of the bee. To adhere the bee, I used some dimensional adhesive behind the bee's head and behind his stinger. For my next card, I decided to combine two techniques: smooshing & paper-piecing. I stamped the striped on my background using one of the stamps from So Stripey. I diecut the aqua mist cardstock using the journaling card die from Documented Confetti Cuts. On it, I stamped my sentiment, beehive and three little bees. with some summer sunrise ink. before adhering them to my panel. Sun 'n Clouds Confetti Cuts. from my white cardstock panel. summer sunrise, hibiscus burst and aqua mist) with a Tim Holtz blending tool. I stamped my sentiment (from Shine Bright) in Versafine Onyx Black. I adhered my inked panel to some aqua mist cardstock and then adhered the white cardstock panel with the window using dimensional adhesive. I diecut some clouds from the new Sun 'n Clouds Confetti Cuts and adhered those with dimensional adhesive, too. For my next card, I did some more inking with my Tim Holtz blending tool. from Sun 'n Clouds Confetti Cuts into my cardstock panel. inking the sky with aqua mist. Using sticky notes as masks, I applied some summer sunrise ink in a start burst pattern. I added some more diecut clouds and stamped my Shine Bright sentiment in tropical teal ink. A few MME enamel dots finished it off. Sage was watching and suggested I use the silver one. She has such a great eye! my Tim Holtz blending tool. 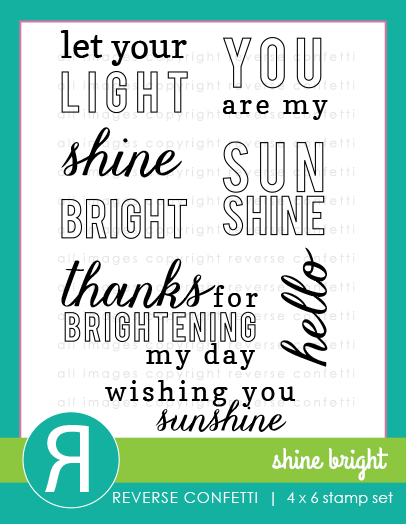 I stamped my sentiment (from Shine Bright) on my card front using my MISTI. Then, I flipped my card over and stamped it again. on the card back and stamped again with the MISTI. Then, I was able to adhere my diecuts to the front of my card. 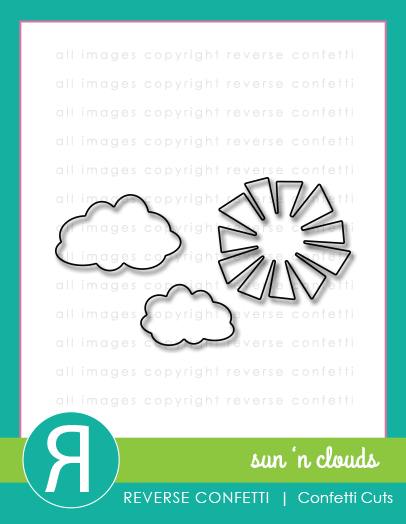 I used Tombow mono adhesive dots for the sun and then dimensional adhesive for the clouds. I'm loving how this turned out -- and how quick and easy this was to stamp using my MISTI! announced later today at 5pm CST. Wow I love how you did the backgrounds, so pretty!!! OOOH! Great cards here, Leigh! Such pretty ink blending on your projects! Thanks for sharing. WOW! Nice selection of beautiful, well thought out cards. Great job! Loving all the cards made! Color combo are pretty! So loving the shine bright and the buzz stamp sets! Nice cards! A lot of design ideas here, especially like the scene inside a frame. I could not choose which of the five cards I like the best. They are all so very pretty! Great job! Fantastic cards, LOVE them all. Cards are all so pretty. Have to try that blending tool. What beautiful, clean cards. I don't know which one I like best - love them all. Wow!! Those last two inked cards are my favorites! I found myself staring for a few minutes!! I love love love your cards!! Amazing techniques and beautiful blending! The cards were great. Love the layering. The clouds are so pretty. Wow! These are all so great!! Love the bee highlighted in the scalloped circle. What an adorable combo of card and tag! I love your sweet little bees! Very cute cards! Leigh, your designs are amazing! So simple, yet have such a WOW! Wow amazing cards! I love the vellum bee and the embossed clouds! You just amaze me with your ability. I LOVE all these cards. The design is stunning and I am so in awe with the way you make your backgrounds. Stunning design. Wonderful cards! My favorites are the window with the soft inking and the clouds one and that last one, great inking and great stamping/technique! Well you really did shine bright with your lovely cards. Thanks. You out did yourself again! Love all these sentiments! These are all so beautiful!!!!! OH my goodness wow!!! These are all adorable and amazing! Your ink blending is gorgeous! Wow, I came here looking for your PPP post, but these projects caught my attention first. I love the CAS designs and soft colours. The bees are so cute. Love every single card. That last one is brilliant! Leigh your cards are all stunning! Love your Reverse Confetti creations but I am so taken with your gorgeous ink blending done so softly. FABULOUS display of cards Leigh, love the soft buttery yellows and light blues! Beautiful collection of cards, Leigh. I love all of your cards they are amazing. I love all of the different backgrounds. So adorable. I love these cards! These aren't normally items I'd purchase, but your cards have completely won me over! Thanks! Another series of ever-so-creative cards, Leigh...bees, spring colours, sunny skies...utterly gorgeous!